When I was a kid, about the only link to my mom’s Norwegian heritage was the food we ate at Christmas: Norwegian meatballs (not to be confused with Swedish meatballs! ), lefse, rosettes, melting moments cookies and one of my favorites: krumkake. 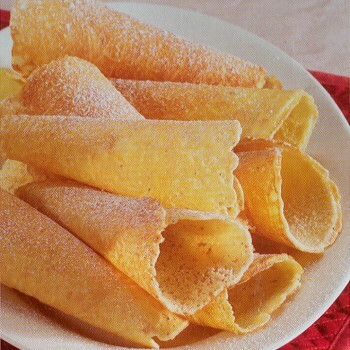 Krumkake are wafer-thin cookies rolled into cones, slightly sweet and not a little addictive. When I turned 21, my mom gave me her krumkake iron, which had been given to her when she turned 21 by a dear family friend. I hope to continue the tradition. You can probably find your own iron at Olsen’s Scandinavian Foods in Ballard or online. The one I have was made by Nordic Ware in Minneapolis and fits over a stovetop burner; newer ones are electric. If you’re up for a bit of a challenge, they’re well worth the effort! Mix sugar to beaten eggs; beat well. Add melted butter, then flour and flavoring. Drop by teaspoon (we always use a dinner spoon) onto krumkake iron. There’s a pretty good primer on the process here. The first few you make probably won’t look pretty and that’s okay. Some people fill them with whipped cream and fruit, but we always preferred them unadulterated in the traditional Norwegian way. I have no idea how many this makes, to be honest. Probably around 2-3 dozen. Store uncovered or loosely covered so that they retain their crispness. Want something a little easier? Try my great-grandma Anita Butler’s Melting Moments cookies. They’re basically shortbread with icing. Whenever I make them for a party, they’re gone in a flash. Seriously. I’ve seen people fight over the last one. Play around with the consistency by adding more powdered sugar or more milk until you get it right – not too drippy, not super thick. Dip top of cookies in icing and place on a bakers rack or wax paper to dry. If you like, you can add sugar sprinkles as well. These will take several hours to dry. Makes around 3 dozen. Try not to eat them all at once.